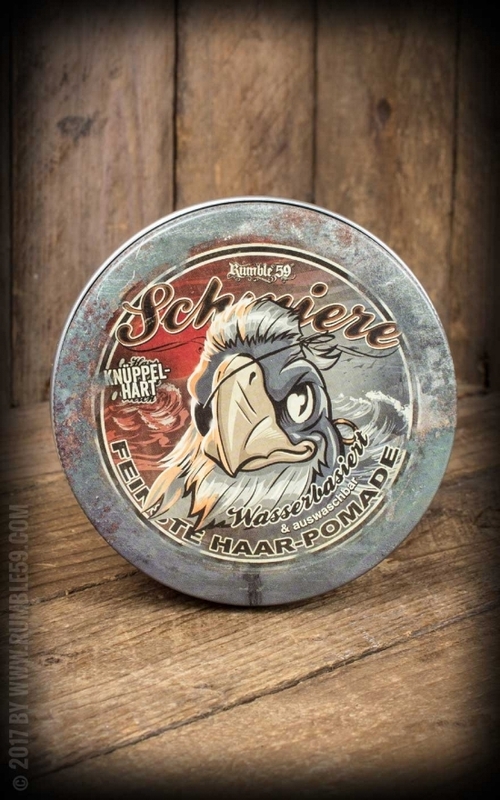 The water-based pomade by Schmiere is now available with extra strong hold. And best of all: As usual, we spared no efforts to fill it into a cool printed aluminum can with stupefying 250 ml content! It'll be a tough job to grease this huge amount! This pomade is perfect for beginners, because it's as simple to use as classic pomades, but easier to wash out. The gel-pomade with a strong hold convinces with simple treatment, good washability and a great look! It was just that the Schmiere ravens have staked out their claim, a long missed relative with colorful feathers was washed ashore. And you better don't mess with this scoundrel! After marauding the seven seas - and every nest on the coasts - he continues his prey round here with his one-of-a-kind knowledge of waterbased pomades. He's a worthy new member of the Rumble59 Schmiere-Gang and an extraordinary support at robberies and with styling-issues alike. The water-based pomade rock hard has an extra strong hold. It has a jellylike texture, an orange color and has a fresh scent of juicy oranges. 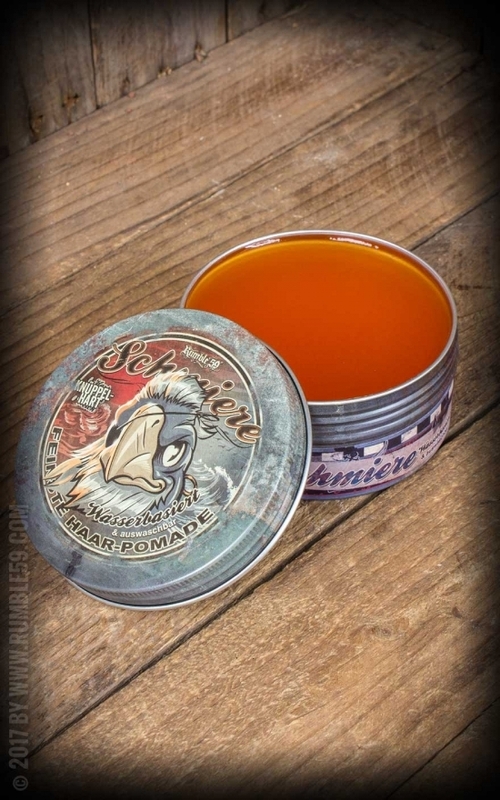 This pomade has many advantages: Your hair will be very easy styled and combed. 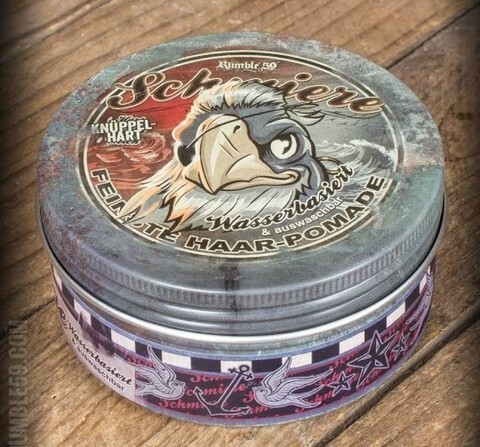 But in the end this pomade convinces with its' washability. The water-based pomade has the benefits of a retro-pomade but is easier to wash out - even without shampoo! The included castor-based oil ensures a unique advantage compared to common gel products: It provides the perfect style and easy spreading on the hair - of course without drying it. Your hairstyling will last the entire day! 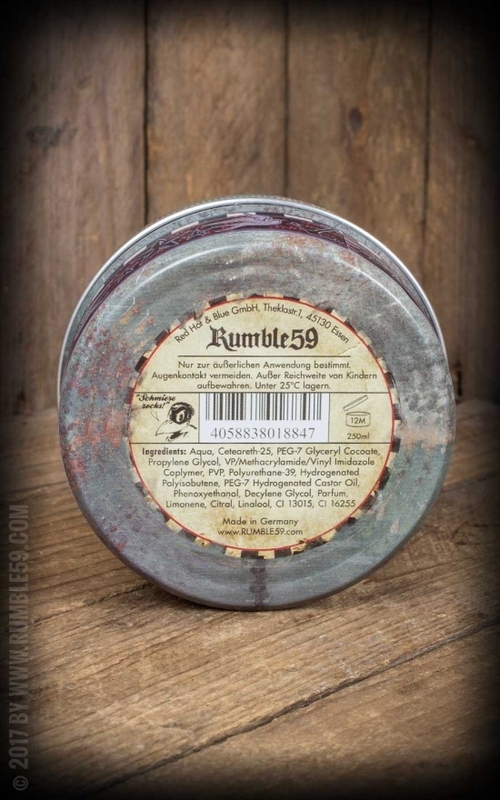 For the perfect glossy finish, the water-based pomade is perfectly combined with the Rumble59 - Schmiere - Pomade brilliance/ light. Water-based pomade by Schmiere is also available with medium and strong hold. 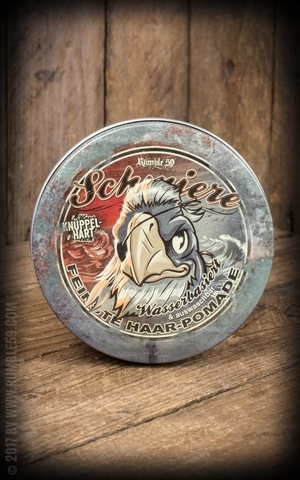 The water-based pomade by Schmiere can be applied on dry or also on wet hair. For a classic 50s styling take some pomade and rub it between your fingers or hands. Spread it over your hair and style it as desired. 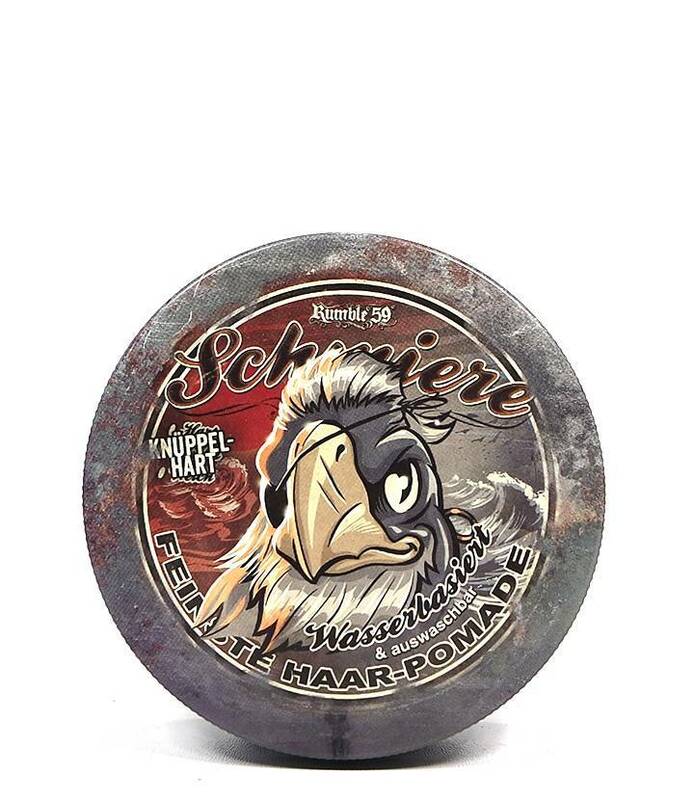 After the pomade has set a little bit you could spread some Schmiere - Pomade brilliance/ light for a perfect shine. Schmiere by Rumble59 offers a great range of pomades. Each one is beautifully designed, produced with love and provides the perfect styling - and definitely not only for classic 50s hairstylings!